This is a casserole that started off with my Aunt Susan’s delicious Tuna Noodle Casserole recipe, and has evolved to my liking. I make this a lot for friends who have just had a baby. It is soooo bad for you, but it is the best comfort food you will ever eat. Like, ever. 3/4 pounds of fusilli pasta, cooked to al dente. Cook the pasta in salted water to al dente, set aside. In a large saucepan, over medium heat, heat up the cream of mushroom soup, mayo, milk, and cheese until cheese is melted. Add corn & celery. Add chicken. Pour noodles into the pan, and stir. 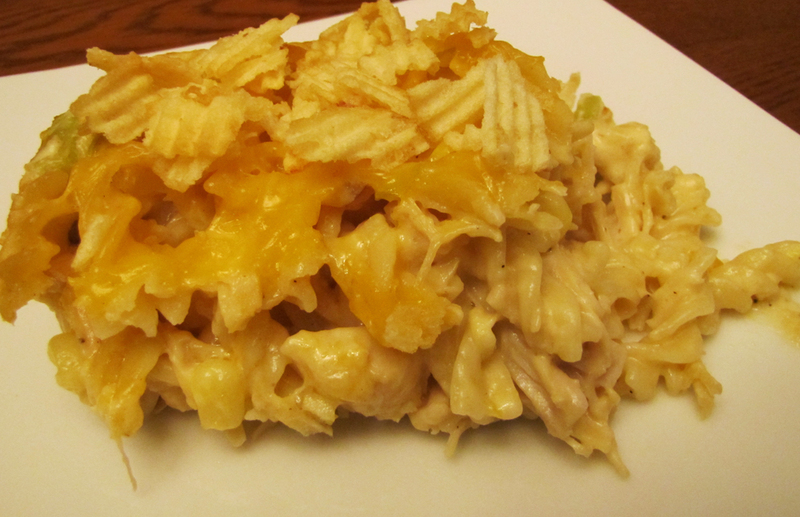 Pour into a 9×13 inch baking dish, and top with cheese and crushed potato chips. Bake at 350° until cheese is melted and potato chips are browned. Enjoy!